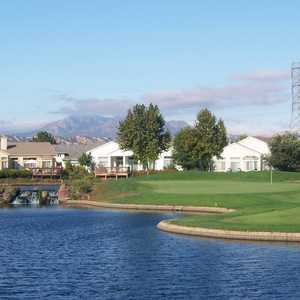 BRENTWOOD, Calif. - Brentwood Country Club golf course runs in and among the houses of Summerset Housing Development. (More about the housing development later.) Located at the eastern edges of the foothills, this course overlooks the unique twin peaks of Mt. Diablo available from this view. 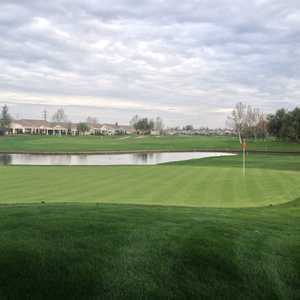 It's an 18-hole bent grass course with water in play. It was designed by Ted Robinson and built in 1994. From the blues it's 6,608 yards long with a 71.2 rating, a 128 slope, and a par 73. You must use a cart, which is included in the fees. Non-members weekday green fees are $45, weekend $47. Not bad considering that the course is beautiful and the cart is included. The driving range offers both the opportunity to hit from the grass and from a green pad. There is also a suitable chipping area onto a practice putting green. The 1st hole is a straight away par 4, 369 yards from the blues. Slightly uphill, this hole has a pond on the left which narrows the fairway slightly. The green, with a variety of bunkers to guard it, sits up above the fairway and is sloped away from the hole both towards the left and back towards the tee. Right away you learn that the toughest thing about this relatively young course will be the greens. Understandably, Brentwood needed to accommodate the common requirement of putting new homes on the fairways. This means that the cart path is often times convoluted. Furthermore, Brentwood is in the throes of building nine additional holes to replace those on the front nine. All of this leads to the 2nd hole which required the use of an overpass to access. 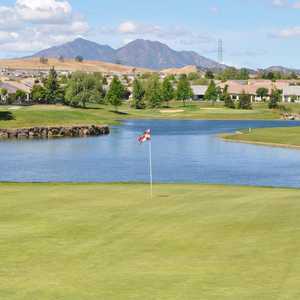 The 2nd hole, a short 297-yard par 4 is a dogleg right around a waterway about 150 yards long. The third hole is a 344-yard par 4. This hole is a perfect example of Ted Robinson's design work. Mr. Robinson is quoted as say, "It takes twenty years to make a golf course." If Mr. Robinson had dropped some bombs on this piece of ground 20 years ago, let the rain and the wind smooth out the edges and then come along and built some houses around it and grew some mighty nice grass on it... it would be a fitting description of the convoluted nature of the fairways in many places. Rolling bunkers and hills and humps and little valleys are just a hell of a lot of trouble for a golfer who can't put his ball where he wants to. On the 3rd, the green tilts back towards the tee, but the biggest problem here is the water which comes into play. These manmade waterways with three tiers, and small brook-like falls are quite nice and will become even more attractive as the course ages and the 15 foot maple trees grow to maturity. But unlike sandtraps or bunkers, the water is completely unforgiving unless you're prepared to play the skip stroke. The 4th hole, yet another par 4, this one 356 yards, is not that distinguishable except for the green. This course is where expert putting is important or you can get into serious 3 or 4 putt situations. And the 4th hole, well-guarded as it is by sandtraps, is one of the most difficult. I'll bet 70% of the people who first approach this hole from three feet away, can't put the ball in the cup. The 5th is the signature hole and the first par 3 at 166 yards over the water. You can lay up to a narrow piece of land on the right. The hole is practically an island and the green is not large. The banks, however, are decorated with flowers. This time of year the most beautiful flowers are the agapanthus. The 6th hole is a 533 yard, par 5. Small rolling hills in the fairway, grass cut close, and 100 yards between the houses. The pin sits up on a hill surrounded by big bunkers. Sandtraps are on the right and left. The green is very steep. The 7th hole, a par 3, is 176 yards from the blues with sandtraps on the left which narrows down to only 20-30 yards at the approach to the green. The 8th hole, a par 5, 529 yards straight away has enormous erector set power towers marching along on the right. The pin sits at the base of one of these towers. The green is convoluted. The 9th hole, is a par 4, 354 yard dogleg left around water. There's a bridge on the left, and protective bunkers and sand traps on the right. This course overlooks the unique twin peaks of Mt. Diablo. The 10th hole around behind the club house is a 516 yard par 5. To get there, after going back over the overpass, you pass three ponds with three waterfalls each. The 10th green is very steep and protected by water. The 11th hole is miles from the 10th hole, while they build the new course. The 11th is a par 3, 194 yards. It is slightly down hill over the cart path, with bunkers on the right and sandtraps in the back. The 12th hole is a 371 yard, par 4. A straight shot through the bunkers brings the ball to the dogleg right past the sandtrap. The 13th hole is a 490 yard, par 5 with three water features. You hit over a small pond in front of the tee. The green and the pin sit below an old coast oak, with bunkers behind it and water directly in front of it. The 16th hole is a dogleg right 278 short par 4. The lie of the land contains myriad sandtraps. There's an approach in from the left however, so play left until you can see the green on your right. The green is a multileveled one. The 17th hole is a par 3, 176 yards long. The ponds have egrets which like to eat the pike in the ponds. The 18th hole is a 424 yard par 4 with lots of water and egrets coming into play. On this day, my playing partner, who has a house at Summerset, was an excellent golfer with good advice on every hole. Brentwood offers no map of the course (a temporary problem), so for the uninitiated, it's good to have help. The head pro is Steve Caulkins. Summerset Housing Development was established in 1994. When completed it will contain roughly 2,000 single family dwellings. There are three "villages" yet to be built which will contain the final 1,000 homes. These homes currently range in price from $167,000 to $364,000. An owner is entitled to a $10 discount off the course fees and can bring their own golf cart, although they're shown no favoritism in terms of tee times.